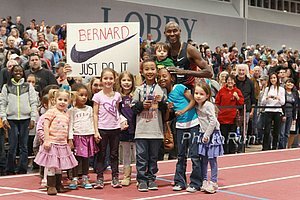 "Honestly, I think it's great for American middle-distance running to be where it's at. But at the end of the day, I'm a selfish person. I want to be on the podium, and I don't really care about other Americans getting [there]. I just know that's where I want to be." - An honest Morgan Uceny talking to the LA Times in this article about the optimal altitude training in Mammoth Lakes. They had a second longer article focusing on Meb Keflezighi and others who take advantage of Mammoth's location to do "high-low" training. Letsrun...picking Shalane Flanagan to win the 2012 Lisbon Half Marathon? Will Robbie Andrews Be the Catalyst to Transform Alan Webb's Career? What in the name of all that is holy....was WEBB thinking??? My 8yr old asked if I heard of Billy Mills!!!! Shalane Flanagan Wins Lisbon Half, Tadese Three-Peats Updated with IAAF story The American got the big upset win (just as we predicted) and Zersenay Tadese got the win but not the world record (just as we predicted). Flanagan ran 68:51 for the win. 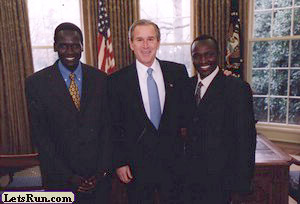 B Of A Shamrock Shuffle: *Results (link fixed) *Discussion Abdelaaziz Atmani won as Abdi was 3rd. Julia Lucas won over Delilah Dicrescenzo. 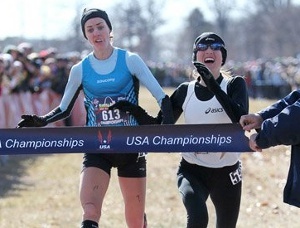 A Look At Top US Marathon Women Who Didn't Make The Team In Houston And Their Plans As They Move To The Track Deena Kastor originally thought her London Games dreams were done, but now is going to try and qualify on the track and says “my legs are waking up to the training and I feel refreshed dropping down in distance." Serena Burla Q&A After Her 2:28:27 Huge PR At Last Week's Seoul Marathon This didn't get a lot of attention, showing how much better American marathoning is getting. A bit surprising Burla didn't run Boston. Japan And Kenya Doing The Best In The World Half Marathon Rankings The Japanese depth is amazing. The Kenyans of course dominate the top marks. Former Marathon Great Ron Hill, Who Inspired Seb Coe To Get Into Athletics, Is Disappointed He Was Snubbed By Olympic Torch Relay Organizers The 73-year-old's snub is disgraceful. He is still 10th all-time on the UK marathon rankings (2:09:28 from 1970) and inspired the Olympic head Coe to get into Athletics. "I was disappointed. In my area it seemed to be about charities. These people ought to be recognised, and are, for the work they do. But this is about sport and Olympians, for heaven's sake. I cannot see any other country in the world celebrating having the Olympics on home soil in this way." British Press Guy Praises New Anti-Doping Location Computer Program The new "ADAMS" - the Anti-Doping Administration and Management System - works much like Microsoft Outlook. Orient Chairman Says With Athletics Track Staying, That Olympic Stadium Is "Not Fit For Football"
Kenyans Cracking Down On Age Cheating? Trials For East Africa Youth Champs Being Held Right Now In Kenya - Officials Says They'll Need To See Birth Certificate Or Passport They want to stop age cheating. Athletics Kenya (AK) received a shot in the arm with National Bank of Kenya forking out Sh33 million for this year's the track and field season. 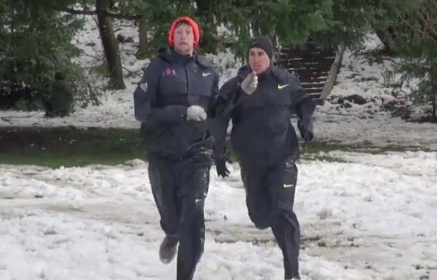 Galen Rupp On How Mo Farah Has Toughened Him Up In Training He says that before Mo, he could give himself an "out" in workouts because he knew the pacers he had weren't doing the full workout or mileage he was. Now with Mo, he can't make excuses. After Being Shot In The Legs Three Times, USC Sprinter Bryshon Nellum Is Finally Pain Free 3 Years Later He was the No. 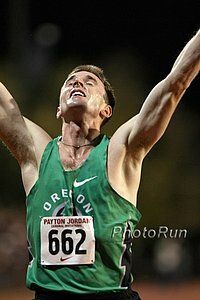 1-ranked 200m and 400m high school sprinter in the nation back in 2007. UK Running Legend Ron Hill Disappointed At Being Rejected As One Of The 7,300 Torch Bearers For The Olympics Was a top marathoner who also has a record-breaking streak of having run at least a mile every day since December 1964. Apparently torch bearers for these Games are being chosen from among charity workers, not athletes. 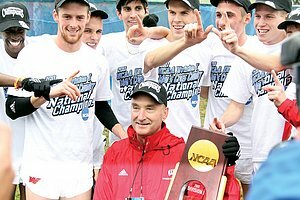 2-Time NCAA XC Runner-Up Renee Metivier Baillie Has Moved To Oregon And Has Recovered From Achilles Surgery She was 4th at US XC. 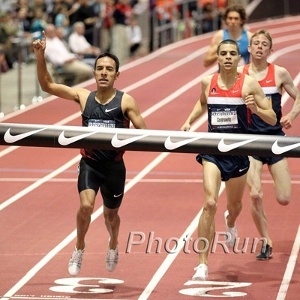 Bring Back The Mile: 4 Minutes With Leo Manzano: Leo Talks About The Mile, Breaking 4 For The First Time And This Weekend's Manzano Mile Leo's got a nice quote: "You don't ask people, 'Hey, how many 1,600s did you run today?' You ask them, 'Hey how many miles did you run today?'" S. African Yellow Pages Meet: Caster Semenya 2:03.60 Win, Mbulaeni Mulaudzi 1:46.41 Win, LJ Van Zyl Is Rusty In 400 This was former world champ Mulaudzi's first race in 8 months, so that's a pretty good performance. LJ Van Zyl only ran 46.50. *Mulaudzi Says The Only Person To Worry About Is David Rudisha He says he's "not really concerned" with anyone else. *Simon Magakwe Leads Two Others To Olympic A Standard In 200m With 20.38 Magakwe has a tatoo that says "Pleasure Boyz" which he qualified for in his younger days by having 10 girlfriends. Kenya: 2:19 Marathoner Lucy Kabuu Gets Ready For London With 15:40 5k Win At Kenyan Track Meet Kabuu and her coach are still hoping to make the Kenyan Olympic marathon team with a win at London. Italy: Ethiopia's Yacob Jarso Wins Stramilano Half-Marathon In 1:01:07 Jarso (4th in 2008 Olympic steeple) beat out Andrea Lalli in the last 800m. Italian marathoner Valeria Straneo won the woman's race in 1:08:48. Dai Greene Says He's Staying Relaxed And Not Letting Olympic Pressure Get To Him "I'm not going to get strung up on it ... I'm pretty sure that it'll be 400m that we'll run and it'll still be 10 hurdles. I try not to complicate things too much." Former UK Rowing-Great, Sir Steve Redgrave, Who Won 5 Olympic Medals At 5 Consecutive Games Doesn't Think He'll Be Chosen To Light Olympic Flame At the last London Games an unknown athlete was chosen for his 'Olympian' good looks." Aussie 800m Runner Johnny Rayner Disappointed By Olympic Trials Experience As He Won The "B" Heat While Foreigners Raced In The "A" "Personally, I was a little disappointed that only 6 Australians got to race the “A” 800m at the Australian Olympic trials." Click On This Wallace Spearmon Photo Your money back if you don't like it. Recommended Read!!! Meet Norway's Full-Time Janitor Who Is About To Be An Olympic Marathoner Urige Buta is a 2:09 marathoner who works full-time as a janitor. Incredible. Willis Pre-Race On 1,500 Chances: "I feel like I've put in the training a gold medallist would need to do." "The sky's the limit in terms of what can happen in London." Saturday In South Africa: 2009 World 800 Champion Mbualeni Mulaudzi Will Make His 1st Appearance Since Getting Injured Last June 30th 400m hurdles World Championships bronze medallist LJ van Zyl will also compete. We Agree: S. African Sports Minister Says Passion - Not Money - Will Win Medals In London "Spirit, courage, resilience and loyalty to South Africa is what will win medals at the end of the day." 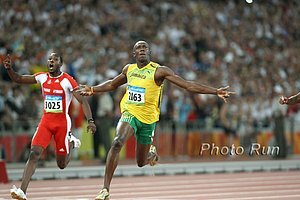 "The Bolt Effect: How Chasing Usain Bolt Made The World Run Faster" Some scientists claim that Usain Bolt is the catalyst for improving overall performance of the top 25 sprinters by 0.9 percent. 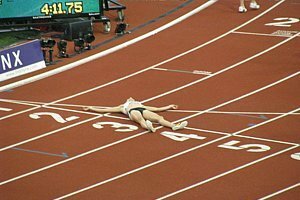 IAAF Asks "What makes a great Racewalker?" Our answer: ability to tolerate frequent mocking and strange looks on the street. WADA Chief Calls For More Blood Testing He says athletes using performance-enhancing drugs such as HGH are "getting away with it" because not enough blood testing is being done. In 2010, WADA analyzed 258,267 samples, but only 5,000 were blood and the rest were urine. Will Vin Lananna Leave Oregon After This Year? The Oregonian takes a look at this after a piece by Jesse Squire. Lananna prefers to create things instead of run them.